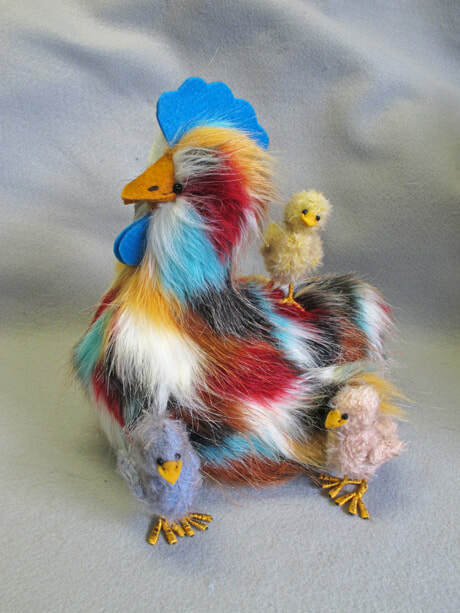 Colorful mother hen Nola sits 12" tall. She is made of Euro faux fur, has onyx eyes and felt features. A bag of pellets in her belly gives her a nice weight. Nola’s chicks can be a handful. Like all newly born critters, they are curious about the world which can get them into trouble. The chicks stand approx. 2½" tall, made of sparse mohair in pink, yellow (matted) and blue. Their eyes are faceted onyx beads; their feet are hand made from wire and cotton floss. 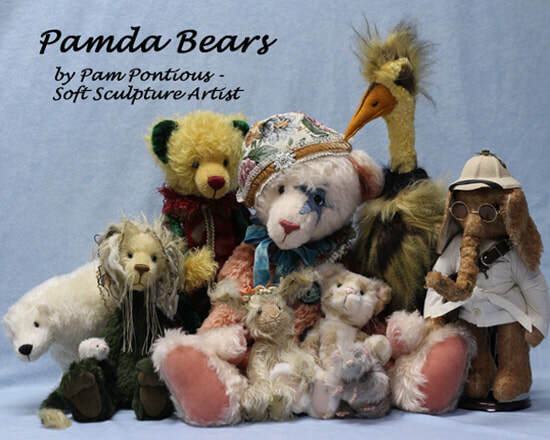 "Nola and her Chicks" are One-Of-A-Kind pieces by Pam Pontious of Pamda Bears and will come signed and dated. • "Nola" is $135 SOLD! 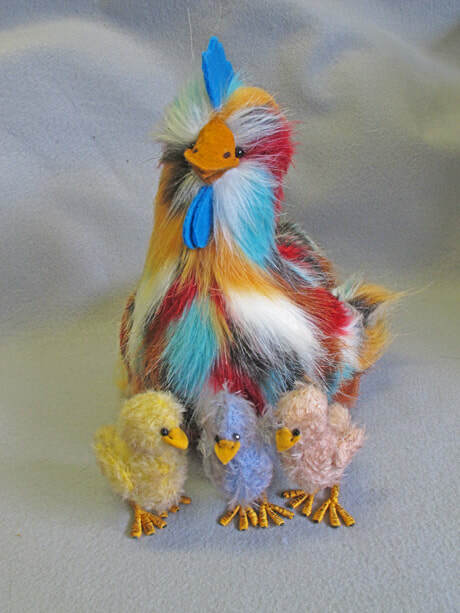 • Her three chicks are $49 each SOLD! includes FREE USPS Priority shipping in the US. BUNNY DEAREST is here in time for Easter. Bunny is made of a tan short pile mohair that has a dark brown backing. He is jointed 5 ways, has glass eyes, and wire armatures in his ears. 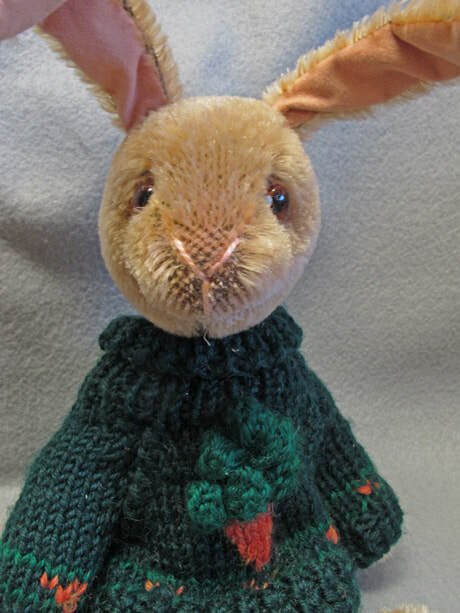 His carrot sweater is commercially made. Bunny Dearest will look darling in an Easter centerpiece or Easter basket. Measurements: "Bunny Dearest" stands approximately 9” tall. 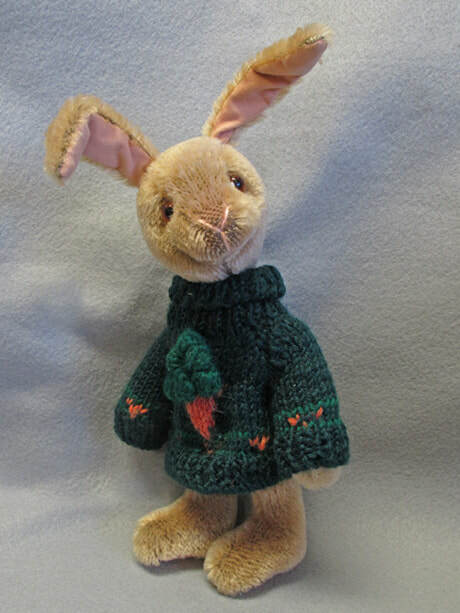 "Bunny Dearest" is a One-Of-A-Kind piece by Pam Pontious of Pamda Bears and will come signed and dated. Price is $148 and includes FREE Priority shipping in the US. SOLD!